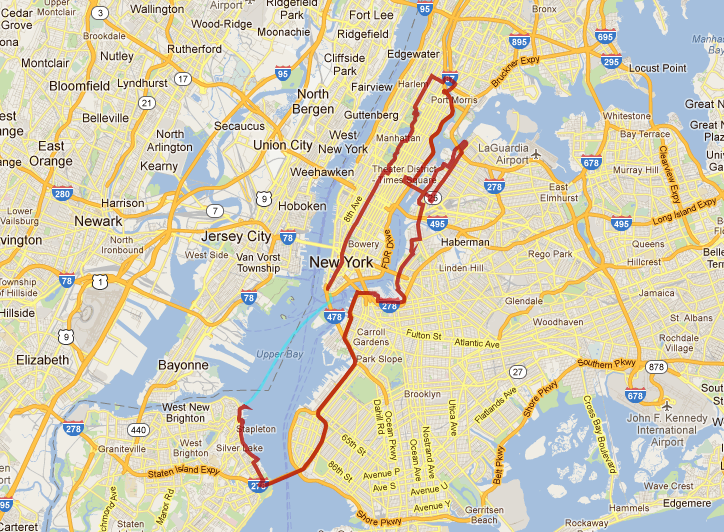 The 2013 Five Boro Bike Tour is this Sunday, May 5th. PACKETS WILL NOT BE MAILED. All participants must pick up their packet and vest at Bike Expo New York on May 3 and 4 (the days preceding the tour). You must show valid photo identification (see valid photo identification) and your registration e-mail to receive your tour packet. Alternatively, you can send a member of your group to the Expo with the proxy packet pickup form, available by emailing a request to info@bikenewyork.org. The Expo will take place at Basketball City on Pier 36 located along South St. at Montgomery St., Manhattan, NYC. Click here to view a map of the intersection of South St. & Montgomery St. Visitors are encouraged to bike, walk or take public transportation. It sits directly next to the East Side Greenway (at Montgomery Street) making it perfectly accessible via bicycle. Bike valet parking will be available. Click HERE for more information on the Bike Expo. In order to minimize congestion at the start, rest areas and the finish festival, there will be three different start times. This will reduce waiting times at the start and provide a better overall experience for Tour participants. In Central Park there will be three full lanes of the East Drive available to riders. Due to construction changes, the Tour will continue to along the BQE and Gowanus Parkway this year to the Verrazano Bridge bypassing Shore Parkway. Start times are organized according to your rider number and color. Please see below for a detailed list of the start times and corresponding rider numbers and colors. You should have received an e-mail containing your rider number in early April. Note that the bike route will begin to close to vehicular traffic at 7:30am, be sure to take this into account when planning your arrival. It is not recommended to drive to the start area for Starts 2 or 3. Tour Marshals will be on site to direct riders to appropriate entry streets. In the event that members of a group are assigned different start times, please leave together in Start 3. Once the ride starts, the front of the Tour travels at 18 mph and the tail at 6 mph. Cyclists who fall behind are given the option of either boarding SAG vehicles traveling at the tail of the Tour or leaving the Tour as the route permits. Interesting Google search data shows more interest in this 5 Boro Bike Tour than other held recently. There is also a ton of interest in Citibike (more on that soon).